Lewis Mason Clement, graduated from Berkeley in 1914 had a long career as a pioneer in the development of radio and television (he built his first spark gap radio station in 1905). During WWI grandson, Lewis Mason Clement, helped develop the first radiotelephone for use in an aircraft while he was with Western Electric and was the first to speak by voice via radio from an the air in a test at Langley, VA, in August, 1917. During WWII Lewis Mason Clement was VP of Engineering at Crosley which was one of the early, key contractors in the development and manufacture of the anti-aircraft VT (variable time) proximity fuze that played a major role in determining the outcome of the second world war. Title: Lewis M. Clement papers, 1938-1975. Description: 1 box (.25 linear ft.). copies of letters from W.R.G. Baker, H.H. Buttner, Alfred N.
Other titles: History of science and technology collection. Lewis Mason Clement, was one of the pioneers of radio and was Vice President of Research & Development and Chief Engineer of RCA in Camden, NJ, in the 1920's and 1930's. He built and operated his first radio station - call letters: 6XC - from his home in Oakland, CA, in 1905 and was Co-Founder and Secretary of the Bay Counties Wireless Telegraph Association in 1907. In 1908 he made the first ever broadcast of a sporting event (University of California Stanford football game) and graduated from the University of California (Berkeley), B.Sc.(E.E.) in 1914. (In his early career he was the Engineer in Charge of the Marconi Wireless Telegraph Co. stations at Kahuku, HT, and then in San Francisco, CA, (1914-16). As an engineer at Bell Labs, Western Electric Co., New York City, (1916-25) he and fellow Western Electric engineer Raymond Heising developed the first aircraft wireless telephone equipment and became the first person to speak by voice from an aircraft to the ground, and from aircraft to aircraft, at Langley Field, VA, August 18, 1917. He also designed, built and installed first commercial wireless telephone toll circuit from Catalina Island to San Pedro, CA (May-July, 1920), and developed the first Super Hetradyne receiver for RCA in 1922. (Among those that he worked closely with during the early part of his career were David Sarnoff, Howard Armstrong, and Valdimir Zworkin.) As VP in charge of Engineering at Crosley Radio during the WWII years he was a key figure in the developement of the VT (or proximity) fuze which was one of the key technical developments responsible for winning the war. His active professional engineering career, especially in the development of radio and television, spanned almost sixty years. 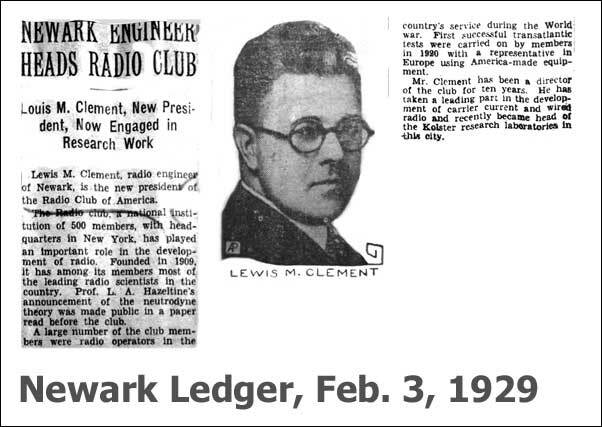 "A True Pioneer of Radio"
Lewis Mason Clement was born in Oakland, CA, in 1892. His father, Russell M. Clement, was the City Engineer for Oakland, and his grandfather, Lewis Metzler Clement, had been Chief Assistant Engineer of the Central Pacific Railroad. In 1905 at age 13 my grandfather built and operated his first spark gap radio station from his home on Wayne Ave. in Oakland. (His first call sign was "6XC" and his last was "K3AA.") He was the co-founder and Secretary of the Bay Counties Wireless Telegraph Association in 1907, and in 1908 he helped make the first ever broadcast of a sporting event (University of California /Stanford football game). He attended the University of California (Berkeley) from which he graduated in 1914 with a B.Sc.E.E.. His first job out of college was as a engineer/operator for the Marconi Wireless Telegraph Co. in Kahuku, HI, & San Francisco, CA (1914-16). In 1916 he joined Bell Labs, Western Electric Co., in New York City, as a design engineer and developed (with fellow Western Electric Engineer R. Heising) the first aircraft wireless telephony equipment for the Signal Corps. (They became the first two people to speak from aircraft to ground and aircraft to aircraft during tests of their equipment at Langley Field, VA, on August 18, 1917.) He designed, built, and installed first wireless telephone toll circuit from Catalina Island to San Pedro, CA (May 10, 1920 - July 16, 1920). In 1922 he developed the first Super Heterodyne receiver for RCA. In the early 1930's he was chief engineer in Europe for IT&T and later for RCA which he also served as VP of R&D in Camden, NJ, where he helped develop early commercial television equipment. He held a similar position with Crosley Radio during WWII and was one of the key figures in the development and manufacturing of the VT (Proximity) Fuse project. After the War he worked on the development of color television and was also a frequent consultant to the DoD on issues relating to reliability in military communications. Did you know that Lewis Mason Clement fixed President Calvin Coolidge's radio? Copyright 2000-2015, CPRR.org. [Last updated 8/25/2015].